Conjunctivitis is the medical term for an infection of the white parts of the eye and under the eyelids. This is also called pink eye. It can cause eye pus or discharge. Blurred eyesight or loss of eyesight is almost always serious. If eyesight is still blurry after wiping away the pus, a doctor's exam is needed. Eye pain is also a serious symptom. With normal conjunctivitis, the eyes can be itchy or irritated. However, if it hurts more than this, a doctor's exam is needed. 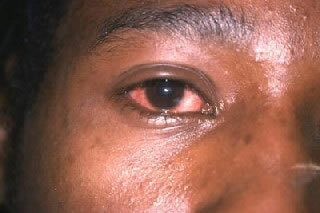 Allergic Conjunctivitis: most often has itching and clear-white discharge. Bacterial Conjunctivitis: most often has thick, white-yellow or green discharge. It is treated with antibiotic eye drops. Chemical Conjunctivitis: Most often has eye irritation and tearing. It can happen after exposure to chemicals or fumes. 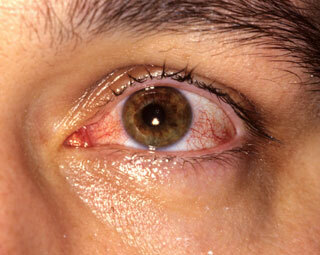 Viral Conjunctivitis: most often has thin, clear-white discharge. It is hard to tell the difference between viral and bacterial conjunctivitis. It is often treated with prescription antibiotic eye drops. Yellow or green discharge or pus in the eye. Reason: you may need antibiotic eye drops. People often get pink eye when they have a cold. You can also get pink eye from someone who has had it recently. Antibiotic eye drops work well to treat pink eye. Pink eye will not harm your eyesight. You can treat eye pus and discharge at home. Gently wash eyelids and lashes with warm water. You can use wet cotton balls or wet cotton gauze. Wipe away all of the dried and liquid pus. Pink eye is very easy to spread to other people. You can spread it by shaking hands. It should get better in 7-10 days. This photo shows conjunctivitis of the right eye caused by bacteria. It requires antibiotic treatment. With bacterial conjunctivitis there is usually yellow or yellow-green eye discharge. Patients with bacterial conjunctivitis typically report more pain than patients with the less serious viral conjunctivitis.